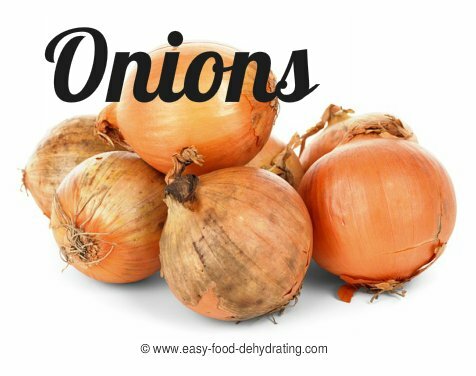 Dehydrating onions can be a tearful job, so please run your range hood vent (if you have one) and place your dehydrator as close to it as possible ... that will help enormously to take the onion odor out of the kitchen and away from your pets sensitive noses and nervous systems – it's poisonous to them! Onions are a great source of vitamin A, followed by vitamin C. There are trace amounts of Niacin, Pantothenic Acid, vitamin B6, Riboflavin, and Thiamin. Their minerals are: a great source of Potassium, followed by Phosphorus, and Calcium. There are trace amounts of Iron, Zinc, Manganese, Copper, and Selenium too. They contains Omega-3 and Omega-6 fatty acids. Frozen Chopped Onions Are SO Convenient! 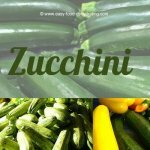 This very versatile veggie is great for use in tons of recipes: Soups and stews, you name it! And you can grind them up for use as a powder! NOTE: When dehydrating this pungent veggie, you may want to consider dehydrating some garlic at the same time if you've got a spare dehydrator tray or two available! Don't mix the two with, say, apples, when dehydrating – unless you WANT your APPLES to taste like ONIONS or GARLIC!! You may also wish to have your windows OPEN, or put the A/C on while you're dehydrating ... as the very strong odor can certainly circulate throughout the whole house! If you ABSOLUTELY LOVE onions it's not such a bad thing ... but if you don't... just sayin'! "I noticed that my white onions did not turn as brown as my Vidalia onions, did a little research and found that it might have to do with the sweeter onion which makes sense. I also noticed that the Vidalia seem sweeter dried then fresh which is fine with me. I am so very happy that I found a great deal on them and dried close to 50lbs of them this spring. I did do many batches outside when I saw that the humidity was very low, with starting them outside in the morning by night the smell was almost gone when I finished them in the home." 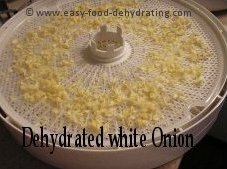 Dehydrating Onions ~ The Easy Way! Heed The Air Ventilation Warning Above! Please be careful when dehydrating onions. Keep pets away as onion-odor is poisonous to them, as I mentioned at the top of this page. If using frozen onions, ignore step 1. Dehydrated onion will be leathery when fully dried. Drying time: between 4-12 hours. Here's a cool post on ten different types on onions and it shows what the best onion is to use in a specific dish.